PB and I are part of a fantastic group of foodies who love anything to do with good food, and we’ve combined spending time with close friends, the love of cooking, and the love of eating into a fabulous dinner party circuit! We all take turns to cook dinner parties for the 8 of us, and each time a different theme is chosen. In the first round of dinners, we determined the theme should be food from each of our cultural backgrounds, and so mine was a mishmash amalgamation of Chinese, Indonesian and English. We are now on the 2nd round, and this time, we put countries into a hat and tried our luck. I managed to pick America, and at first I was uninspired by it. Rather, the idea behind our parties is that we go all out, we create and print menus, we cook for hours, and we choose to make dishes that create a lasting memory of the evening – hamburgers, fried chicken and nachos just weren’t going to cut it. 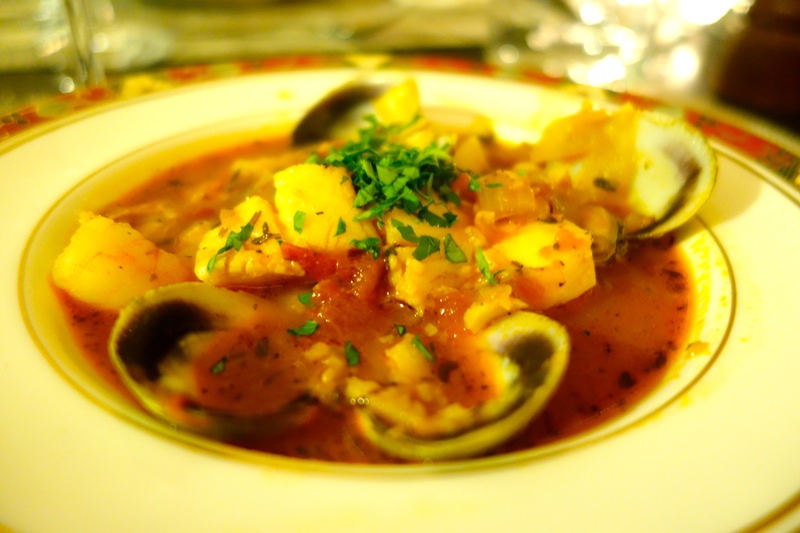 I found this CNN article listing the Top 50 American Foods, and it was a great inspiration – some of the things on the list I hadn’t even heard of, the most tasty looking one being #28 – cioppino. Judging from it’s name, it has no place being called an ‘American dish’, but it is indeed an Italian-American dish invented in San Francisco in the late 1800’s. The dish is comparable to a French Bouillabaisse, and was apparently created by a famed Italian fishmonger, who would make it from any leftovers of the catch of the day. 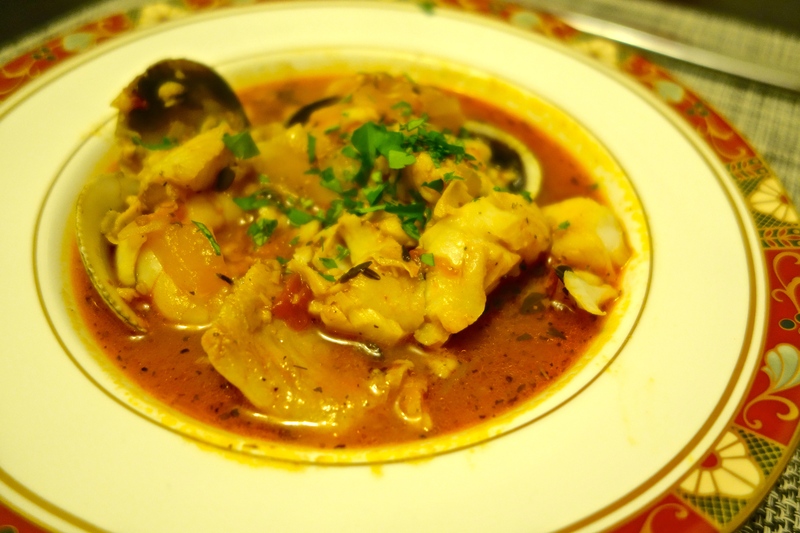 Typically, cioppino is made with a firm white fish, some mollusks (mussels, scallops or clams) and shellfish (crab, prawns or even lobster if you’re feeling generous). The recipe below was with halibut, prawns and clams, but next time I’ll try to add some scallops too, as well as increase the amount of the cooking broth to have a more soupy consistency. Basically, you can throw whatever you want in there – this recipe is simple, easy and super tasty. Believe me. The broth can be prepared in advance and then finished 15 minutes before sitting down at the table. ♥ Heat oil in a large stockpot over medium heat. Cook onion and garlic until onion is translucent, 3 to 4 minutes. 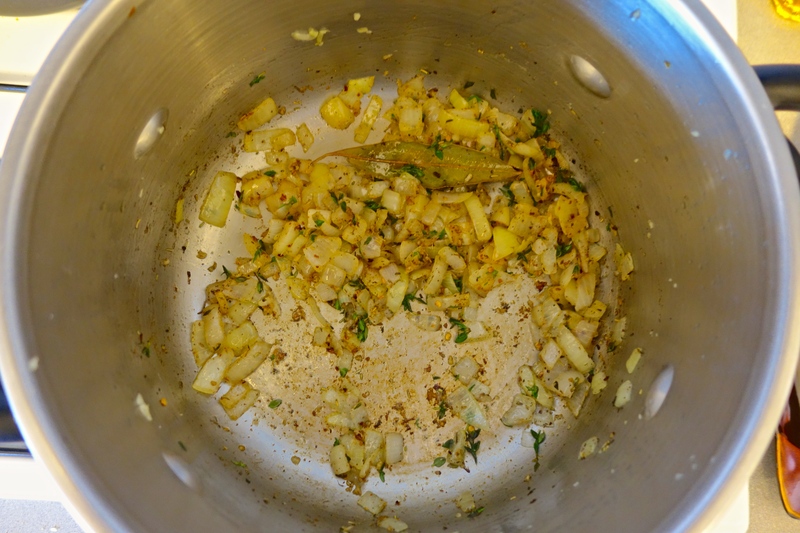 Stir in thyme, herbes de Provence, red-pepper flakes, and bay leaf. ♥ Add crushed tomatoes and their juice, white wine, water, and clam juice. Cover and bring to a simmer for 10 minutes. ♥ Add the clams. Simmer, covered, until clam shells open, about 10 minutes. Season fish with salt and pepper. Create some space in the pot and add fish and shrimp to stockpot (try not to stir too much or the fish breaks apart). ♥ Simmer, covered, until fish is opaque and shrimp are pink, 2 to 3 minutes. Discard bay leaf and any unopened clams. ♥ Remove pot from heat. Stir in most of the parsley. Season with salt and pepper. Reserve some chopped parsley to add before serving, as a garnish. ** For those doing their shopping in Hong Kong, Clam Juice (HK$32) is available at Oliver’s Delicatessen in Princes Building, as is the halibut (HK$32/100g) and peeled prawn meat (HK$25/100g).The live little neck clams are available at C!tySuper (HK$22/100g). I’ve seen more complicated recipes that require simmering for longer, but really it’s unnecessary, making this a super easy recipe to make. I used Herbes de Provence because I didn’t have dried oregano and it was one of those happy accidents that worked out well!